How I learned the importance of Vision. One of my favorite podcasts is Creative ScreenWriting Magazine because every week they interview a writer and begin each discussion with “breaking in” stories. This isn’t exactly my breaking in story but it is interesting non the less so please indulge me. As many of you know (cause I keep typing it here on my blog over and over) I used to make comic books for a living and through running my own publishing company I learned most of the lessons I share now in my fancy pants role as “The Smartest Man in the World”. Probably my favorite lesson that I have never shared was “How I learned the importance of Vision” so grab a coffee and enjoy cause this one is a tear jerker! In comics I had the pleasure of working with some amazing artists. 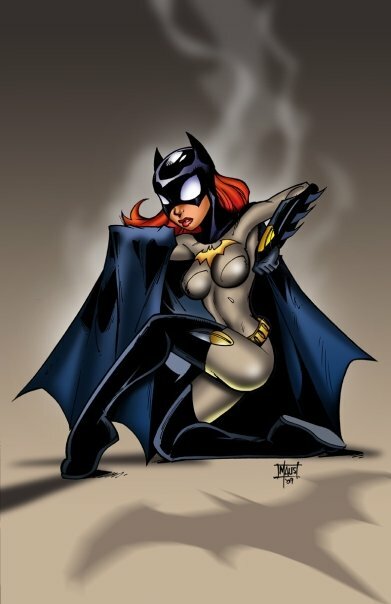 One of my favorites was Bill Maus (That is his Batgirl drawing) because he drew beautifully, we got along well and he would make me think about stuff. Bill told me this story about before he got enough work to draw comics full time he was also a caricature/portrait artist at Sea World in San Diego. One day while working there, a family came up to get a portrait of their son. The boy sat down and Bill noticed that he was missing an eye and didn’t have a patch just an exposed socket. He began drawing the boy and purposely left the eyes for last because he had to decide how he would tackle this. After a little thought he drew the boy with two perfect eyes because he assumed that in the mind of his parents that is how he saw them. When he presented the drawing the look on the parents face confirmed he had made the right decision. I was thinking about this recently and it dawned on me that this is a business lesson. You not only need to see your company or brand as what it is right now but also what it can be and what you want it to be, because how you see your business is going to shape how you discuss your business and how you discuss it is going to also be how others see it. I haven’t spoken to Bill in a while and for all I know I am remembering this the way I want to but either way I’m going to give him a call and say hi and thank him for the inspiration.